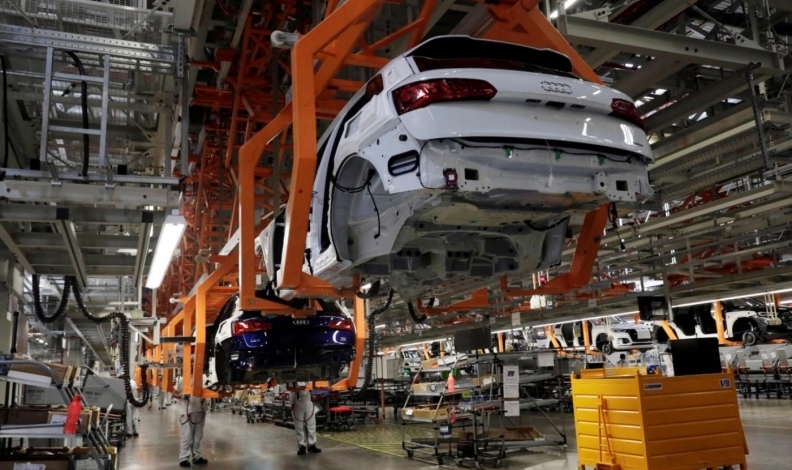 Employees work at an Audi Q5 2.0 production line of the German car manufacturer's plant during a media tour in San Jose Chilapa, Mexico, in April. FRANKFURT -- Making Audis in the U.S. could help Volkswagen Group protect almost $800 million in profit that its luxury-car unit reaps from the world’s second-biggest automotive market. Audi generated 5.06 billion euros ($5.7 billion) of global operating income last year, excluding items, making it the biggest single contributor to Volkswagen’s overall profit. About 700 million euros of the brand’s earnings before interest and taxes, or 15 percent of its total, comes from the U.S., estimates Michael Dean, an analyst with Bloomberg Intelligence. The sum would be essentially wiped out if President Donald Trump followed through with a threat to impose a 25 percent duty on automotive imports from the European Union, BI estimates. VW Chief Executive Officer Herbert Diess and other German car executives met with President Donald Trump on Tuesday in a bid to prevent the move. Diess floated a number of options to increase U.S. output, including building a new plant or locating some production in Ford Motor Co. factories. Volkswagen is in advanced negotiations to expand the work at its plant in Chattanooga, Tenn., which still has extra capacity, but there are other options as well, Diess said. For Audi, a U.S. factory would help narrow the gap with Daimler AG’s Mercedes-Benz unit and BMW AG in terms of global reach. Audi has been the market leader in China for years, but a spat with dealers hurt deliveries last year. In Europe, the manufacturer is struggling to draw a line under the 3-year-old diesel-emissions scandal. But the brand has been expanding in the U.S., and making SUVs there would give VW some insurance that its flow of profit from the region won’t be interrupted should trade disputes linger or crop up again after the current round is settled. “It would make sense to make the Q7, Q8 in the U.S., given it’s a key market for these cars, which sets up the potential for all the big SUVs to be made there, including the Porsche Cayenne,” Dean said in an interview. While smaller than VW brand or Audi, Porsche delivers the highest profit margins of any VW unit. No decision is imminent, Audi strategy chief Roland Villinger said Wednesday. The brand’s growing presence in North America and the gradual rollout of new technology shared across the VW group work in favor of eventually establishing local production, he said. “It’s something we’re looking into frequently,” Villinger told Bloomberg at the Handelsblatt auto industry conference in Wolfsburg, Germany. Audi's U.S. sales fell 11 percent in November to 17,082 units, but are up 0.5 percent to 200,558 deliveries for the year-to-date.